BELGIUM MAY BE A SMALL COUNTRY BUT IT SURPRISES AND DELIGHTS on many counts, offering an interesting and wide variety that normally can only be found in larger countries. Several high quality consistencies that abound throughout include fascinating architecture, as well as imaginative and accomplished cuisine. It was the latter that brought us here a few weeks earlier for a gourmet weekend in the Ardennes and we could not resist returning to sample the fare in Flanders. It had been a while since we had spent a weekend in Flanders  the most accessible part of Belgium. The northern half of Belgium looks, in parts, more like the romantic areas of Holland than the neighbouring country does itself. The destination is also well served via Dover-Dunkirk with the lesser-known but up-scale Norfolk Line. We cannot speak too highly of this ferry operator and have always found them helpful, comfortable and delightfully uncrowded. If you have not visited Bruges you have missed a treat, despite the throngs of visitors who rather overwhelm this small historic and intim-ate city that is a UNESCO World Heritage Site. 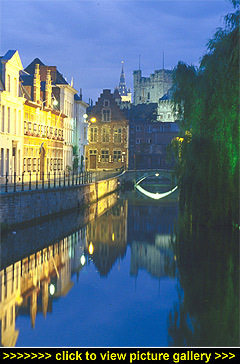 In recent years we have tended to favour nearby Ghent, which has not previously enjoyed such popularity despite an equally illustrious history and much fine architecture. We rather like the somewhat shabby chic buildings and uncrowded streets, which have a relaxed atmosphere. However, we have now found the ideal way to enjoy Bruges by avoiding some of the crowds whilst adding interest: stay in the nearby village of Damme and commute along the canal by ferry. The centre of Damme is sheer delight, with a fairytale town hall and traditional Flemish buildings. There are a number of small hotels and excellent B&Bs. For a very warm welcome and great hospitality, the atmospheric De Spieghel bar/restaurant will entertain you  and you simply must sample the stewed eels. Another option is to stay on the coast itself  a long stretch of sandy beaches with rather enchanting traditional seaside resorts, some of which retain the style of their Belle Époque. Of particular note are Knokke Heist and De Haan. The former is a fascinating step back in time, with a sense of misplacement: Surely this should be next to the grand villas on the French Riviera? Elegant alfresco coffee shops, fashionable boutiques, sumptuous holiday mansions, the 'see and be seen crowd'… Smart is the dress code, and fitting in perfectly will be your new Mercedes Benz SL  both of which will complement the tightly-clipped lawns and well-tended flower beds. This you really have to see to appreciate, but we chose to stay in De Haan; which ticks all the boxes as a good place to stay both for a family wanting a seaside holiday and as a place to enjoy a weekend  or longer  stay at any time of the year. It is also a good base for visiting some of the major sights in the area. The Romantik Hotel, Manoir Carpe Diem, obviously ticks all the boxes for many people as it was fully booked  even during the normally very quiet lead-up to Christmas. The hotel is a deceptively spacious house, with fifteen rooms and suites, set in a quiet residential area. This is within easy walking distance of the sea and the centre of the resort, which has six recommended restaurants including one of the best on the coast. An in-house restaurant would have been rather superfluous as there is a myriad of choices nearby. However, the hotel does have a good breakfast room where one can find everything imaginable, from cooked dishes through fresh pastries and croissants to dried and fresh fruits. In talking to fellow guests, it is apparent that many of them visit several times a year rather than owning their own holiday home. What better recommendation! The logic is sound: the welcome is very warm, and the whole approach is that you are in a place you can call your own. An honesty bar with a great selection of whiskies (amongst other drinks) and numerous comfortable sitting areas so that a quiet corner or two can always be found. In addition, there is a pool, gardens, several rooms with balconies or patios and the décor reminds one of the very best American inns  certainly a great compliment. Claudine and Philippe, our congenial hosts, have respectively designed and created a really successful home-from-home feel for every room and suite. Some of the family rooms will delight parents and children alike, as they are romantic and fun at the same time. Our suite was high style. If you are looking for top brand names in bathroom fixtures, lights, gizmos, etc, you could find them; but the overall effect was cool, calm and collected. The lighting system could create many mood change options  by the time we checked out we had come close to mastering the switching! Other rooms and suites followed different styles to create an eclectic choice but you should know that their web site does not do their achievements justice. to make any impact on Ghent's polluted environment. Today, restoration in Ghent is gaining even more momentum to the extent that it is a major concern the city will look too pristine and be spoilt  as sadly happened in Chartres. In and amongst the historic street scene the city has a thriving student population to give it a good pulse, as well as some absorbing museums that include the Museum Voor Schone Kunsten  an 18th Century decorative arts mecca. Religion was always strong throughout the country, and this is fully reflected by Ghent's magnificent Gothic cathedral which was started in the 12th Century, with building continuing for literally hundreds of years. Culture vultures will be suitably rewarded and entranced. We have always eaten well in Ghent  down to its combination of good atmosphere and very competent kitchens. We had heard in Brussels that the Belga Queen's eponymous Ghent 'sister' restaurant was outstanding and when we then discovered that Antoine Pinto  one of central Europe's best chefs  was involved with the Belga Queen, we knew it was unquestionably in the top league. 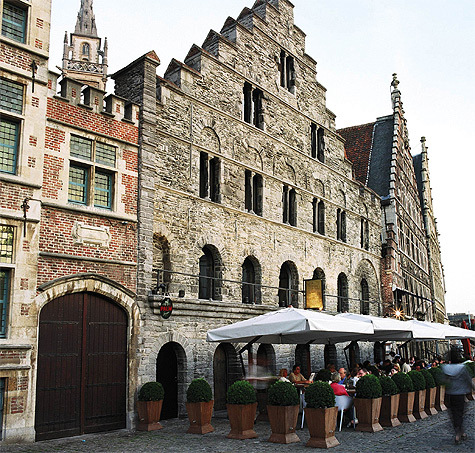 The restaurant is located in reputedly the oldest building on the Graslei, a street in the old harbour of Ghent, located on the river in a 13th Century granary right in the centre of the city. It is flanked by other similar buildings, so in this particular context it is not out-standing. Open the door, however, and everything changes. 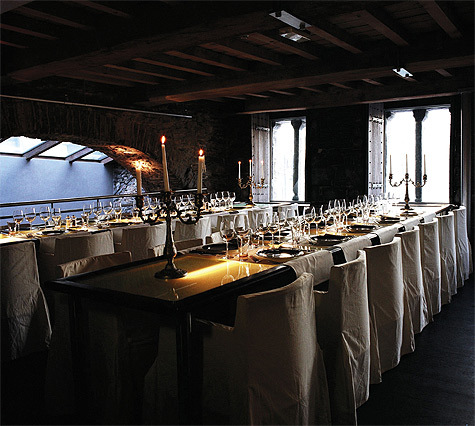 Antoine Pinto is also a noted architect and has transformed this formerly empty shell of a granary into a modern masterpiece, and all without spoiling the integrity of the 13th Century structure. No room for Disney here; this is clearly in the third millennium. The rough-hewn stone exterior walls have been restored and the internal structure appears to be freestanding. New floors and infrastructure have been created using a combination of giant timber beams with stainless steel fixings, whilst aluminium service conduits and ducting are tortuously threaded through. It is certainly a triumph in finding a comfortable match between the 800-year age difference. The only hesitation is in the design of the loos, which initially raises a few eyebrows. But that is another matter, and is doubtless a humorous topic of conversion raised by all diners who visit. in unique surroundings  a passionate showcase of some of the best of Belgium. Our gastronomic journey started in large brown leather armchairs front-ing a low dining table  not the most obvious choice, but that was just the beginning. We began with a delicious cool glass of cherry kir  an interesting diversion from the usual blackcurrant kir with cham-pagne. The British love affair with champagne is legendary  after all, what drink can make you feel more festive and sophisticated than a sparkling glass of bubbles? We then embarked on an almost awesome gastronomic experience, consisting of some of the best fish I have ever tasted. The tempting array of dishes was so mind-blowing that we asked Stijn, the maître d'hôtel, to make selections for us. He did, of course, choose well. To start with: puff pastry with little grey shrimps from Ostend, monk-fish, mushroom sauce and pan fried duck liver  it just melted away. The salmon, marinated in Rogenbach (Belgian beer) with herbs and mild mustard sauce, was an interesting and good variation on the more well-known gravadlax. But then came two truly memorable dishes: a sole meunière accompanied by fresh vegetables and a large but perfectly cooked Charolais tenderloin steak, served with a beer-based béarnaise sauce, vegetables and the Belgian cone of French fries. The superb ingredients had a freshness shining through to every last morsel of the intricately-flavoured and beautifully-presented dishes. Wonderful and truly memorable. To finish, we had a selection of puddings to share  a crème brûlée with pistachios, chocolate mousse accompanied by a crispy biscuit, exotic fruits and more. Together with the sublime white wine and delightful, charming and friendly service we found it very difficult to drag ourselves away to catch our ferry home. visit  not just for the food, but also for the friendly service in innov-ative surroundings. The relaxed mix of business diners (men and ladies in suits) together with ladies socialising, proves that the experience is worth every penny  the Belga Queen is a fine example of 'you get what you pay for'.